Ely Cathedral was made for a concert like this. Choristers from Ely, Chelmsford and St. Edmundsbury Cathedrals presented an event that showed their voices at their best. The clear, ringing tones of well-trained boys’ voices could be heard throughout the Cathedral, no need for microphones here. They sang a programme of serious and light-hearted music, ranging from Benjamin Britten’s ‘Missa Brevis’ to Horovitz’s ‘Noah’s Flood’. There were some particularly well-known and well-liked pieces including Fauré’s ‘Pie Jesu’, and ‘Cantique de Jean Racine’ and César Frank’s ‘Panis Angelicus’. Under the astute directorship of Paul Trepte, James Davy and James Thomas these choristers acquitted themselves splendidly. Particularly noticeable were the beauty, strength and purity of their voices and their sustained phrasing supported by impressive breath control. Accompanists on organ and piano included Edmund Aldhouse, Laurence Lyndon-Jones and Daniel Soper. Ashley Harries on double bass and Will Sivier (percussion) enhanced the lively rendition of ‘Noah’s Flood’. This was indeed a splendid and well supported evening. Notable events to attend in the future include the free organ recitals on Sundays at 5.15. Those performed in Ely Cathedral will feature Alexander Berry on 6th July, Paul Trepte on the 3rd August and Sarah MacDonald on the 31st August. Ely Cathedral is the ideal venue for a ‘Winter Wonderland’ and the large appreciative audience was given a feast of music in the concert so named. 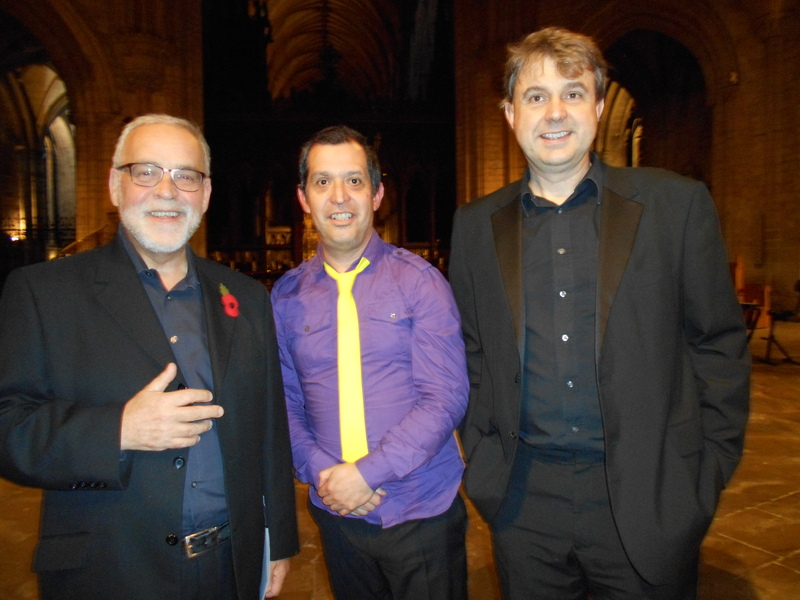 With the Director of Music of Ely Cathedral at the helm, we were bound to have a good time and indeed, we did. There was never a dull moment. Looking at the programme, we could see a lot of ‘old favourites’ but with nearly every performance, there was some kind of surprise awaiting us. Ely Cathedral Choir was glorious as usual, and their unaccompanied songs were of the highest quality and included special versions of ‘Follow that Star’, ‘Winter Wonderland’, ‘Chestnuts Roasting’, ‘Mary’s Boychild’ and ‘Just Another Star’. ‘We need a little Christmas’ with piano accompaniment by Edmund Aldhouse was splendid. Ely Imps and the choristers produced a beautiful sound when it was their turn and they featured in some very agreeable arrangements with the remainder of Ely Cathedral Choir and with the Band in ‘Mary’s Child’, ‘Have yourself a merry little Christmas’, ‘Angel told you to go’, ‘Away in a Manger’, ‘Coconut Carol’, and ‘Good King Wences-ska’. The alteration of the last familiar carol’s title is an indication of what happened frequently in this entertaining event. Familiar carols were given a make-over by local composer, band leader, keyboard player, Pat Brandon. He and his jazz band provided many interesting moments. The other band members were Paul Stubbs (trumpet and fluegelhorn), David Franklin (saxophones: soprano, tenor and baritone), Ivan Garford (double bass) and Derek Scurll (drums). As we all joined in with ‘I’m dreaming of a White Christmas’, the ‘snow’ began to fall from up high in the octagon and the concert was brought to a fitting, seasonal close. The proceeds of the concert will benefit Ely Cathedral and Maggie’s Wallace. Maggie’s Wallace is a charity that supports people with cancer as described in a moving speech by a representative Alyson Luff immediately after interval. With Paul Trepte, Director of Music at Ely Cathedral, wielding the baton, and with The King’s School Chapel Choir and Ely Cathedral Choir performing, I knew we were in for a treat and the concert was indeed, as delightful as expected. A charming programme included an early work by Britten: ‘The Company of Heaven’ and Purcell’s ‘Come ye Sons of Art’. Britten can be a little difficult to listen to at times, with his frequent use of discords, but this early work was very pleasantly tuneful and enhanced with a commendable choir and orchestra and some highly accomplished soloists: Tara Bungard (soprano) and Ben Alden (tenor). Britten’s work opened with atmospheric sounds from the orchestra creating a sense of impending magnitude. The Reverend Canon David Pritchard and his wife Tricia took it in turns to read the text that held the work together. Their clear diction and expression gave a splendid introduction to the music that followed. Highlights of the work included the drama of the opening ‘Chaos’, the beautiful soft tones of the soprano even when rising high above the choir in ‘Heaven is Here’, the images created in ‘Funeral March for a Boy’ and the final, very moving hymn:’ Ye Watchers and Ye Holy Ones’. Purcell’s ‘Come Ye Songs of Art’ balanced Britten’s work well for the orchestration was lighter and was well supported by a splendid continuo (harpsichord and cello and/or double bass). The well-known counter-tenor duet, ‘Sound the Trumpet’ was given a more gentle approach than I am accustomed to hearing, but this performance by Ashley Harries and Karl Read was charming. It sounded authentic and very much in keeping with Purcell’s era especially with the excellent accompaniment by two recorders played by Philip Mizen and Adam Dopadlik. Another highlight of this composition was the soprano’s aria: ‘Bid the virtues, Bid the Graces’ with a worthy oboe accompaniment. James Robinson (bass) also made a fine contribution in ‘These are the Sacred Charms’. This was indeed a very pleasant evening’s entertainment. Prime Brass, conductor Paul Trepte and Johnathan Lilley on the organ have presented highly successful concerts in Ely Cathedral for a number of years. This year’s event was as successful as ever, however, this time there was a difference. A special, new work was included: – Paul Patterson’s The Royal Eurostar. Before it was performed, the composer described what we were to expect and the enthusiasm of his description was certainly warranted by the colour, excitement and variation it achieved. With trumpeters and timpani at different parts of the Cathedral, adding to and contrasting the sturdy band of brass and percussion players in the octagon ( supported by organist Jonathan Lilley) the resultant rolling fanfare of sound had us pinned to the seats, wondering what delights would come next. We could easily imagine the excitement of its first performance at Waterloo Station, the home of The Eurostar, in the presence of the Queen and the Prime Minister then, Lady Thatcher. The rest of the concert contained some momentous compositions that demonstrated the tremendous power and skill of the performers. These included Hymne au Sacré-Coeur by Naji Hakim, Marche Triomphale du Centenaire de Napoléon 1 by Louis Vierne, Spitfire Prelude and Fugue by William Walton, and Entrata Festiva Op. 93 by Flors Peeters. The programme was balanced with moments of beauty and pleasant sustained sounds provided by Fantasia on a Theme of Thomas Tallis by Timothy Jackson and Feierlicher Einzug der Ritter des Johanniter-Ordens by Richard Strauss. Paul’s conducting was inspired throughout and it is no surprise to learn that he received Honorary Fellowships from both The Royal School or Church Music and the Guild of Church Musicians this year. Prime Brass will return to Ely Cathedral on the 20th of October 2012 to help celebrate the 50th Anniversary of the Huntingdonshire Male Voice Choir. The next concert at Ely Cathedral will feature the City Of Ely Military Band on 23rd September 2012.
Review: of ‘O Winter Wonderland’ in Ely Cathedral on Saturday 10th December 2012. The girls, boys and gentlemen of Ely Cathedral Choirs accompanied by 78RPM and conducted by Paul Trepte I Ely Cathedral presented and intriguing concert under the title of ‘Winter Wonderland’. Indeed the song of that title was sung by the choirs and the imagination indeed was stimulated to conjure up delightful pictures in the mind of a cold winter’s night, the ground glistening with snow, the sky filled with sparkling stars. This was all possible because of the amazingly wonderful sound these singers produce. However, the evening was not the traditional one expected. The carols that looked like the same old favourites we can join in with every year had changed! Was there no end to the versatility of these performers. Inspired by the band, the carols assumed a new lively, jazzy character. At first, it appeared that all tradition had been cast aside, but, of course, carols per se used to be lively dances and such alteration may not have been so drastic as one may have first thought.